For All Hair Types : Artnaturals argan oil shampoo and conditioner set is for both men and women, straight or curly hair, blondes or brunettes. This shampoo duo set is the ultimate experience. Restorative Formula : Our natural and organic ingredients help repair hair damage and prevent any effects from heat and excess styling. The hydrating minerals and oils work to hydrate the hair and scalp. Leaving hair feeling soft and refreshed. That shiny, healthy hair you remember from not-so-long-ago can be yours again. 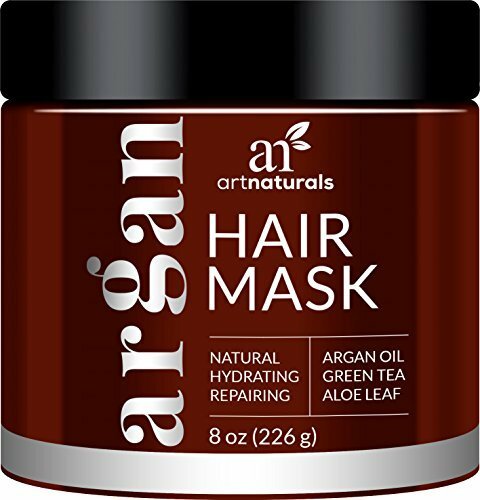 ArtNaturals Argan Oil Hair Mask restores bounce and shine, hydrates, protects color and helps reverse the effects of damaging UV rays with a deep-penetrating fusion of argan oil, green tea, sage and ivy extracts alongside proteins and amino acids. If you color, blow dry, swim in chlorinated pools or the ocean, or expose your hair to the sun—you need this Mask! Argan oil has been proved to make hair softer, silkier and shinier. It helps to treat split ends and tame frizzy hair. This “liquid gold” from Morocco makes hair more manageable and adds a healthy, attractive shine to any style. ArtNaturals Argan Oil Hair Mask deeply conditions dry, limp and lifeless hair while it soothes and moisturizes your scalp. Part of its magic is in the other ingredients: Green tea extract, a concentrated form of green tea, is an antioxidant, fighting thefree radicals that can damage hair follicles. It also helps to protect color. Sage extract improves circulation and stimulates your scalp, preventing hair loss and keeping your hair looking younger. Ivy extract has natural “flavonoids”that help protective hair, and its healing qualities can help to relieve the discomfort and irritation of psoriasis, dandruff, and eczema. Hair is made of a tough protein called keratin. That’s why ArtNaturals Argan Oil Hair Mask also blends in hydrolyzed wheat, oat and quinoa proteins, silk amino acids, and hydrolyzed keratin to help strengthen hair shafts. Gentle and pure, ArtNaturals Argan Oil Hair Mask won’t irritate or cause redness. We guarantee 100 percent satisfaction or your money back. Deep Conditioning and Moisturizing : This powerful moisturizer will wash away all of the excess oils and dirt from your hair to get that beautiful shiny hair. This shampoo set will leave you with no grease and no residue. Satisfaction Guaranteed : ArtNaturals offers a 100% satisfaction guaranteed or your money back. Try it risk free with no questions asked and top customer service. You have nothing to lose and your health to gain.